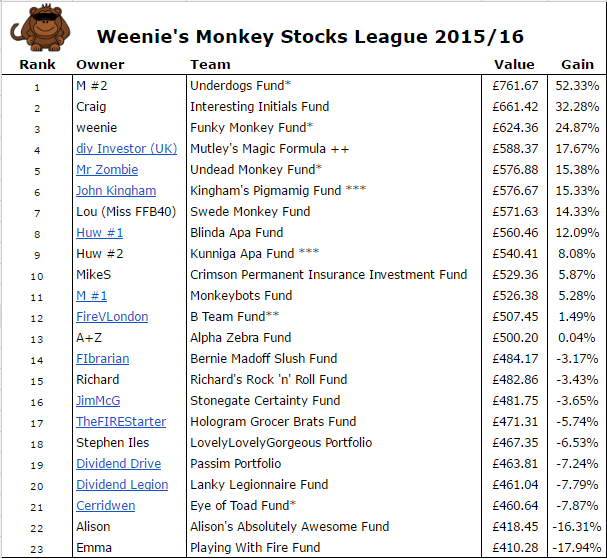 Monkey Stocks League Challenge – Penultimate Update! With the markets on the up in the face of Brexit Bears, how are the Monkeys et al doing in our Monkey Stocks League Challenge? Below is a snapshot as at the close of trading on 31st August 2016 and heading for the finish line and seemingly unstoppable are M’s Underdogs Fund! Can anyone catch up to this ‘fund’ which is showing a gain of over 52%? Craig’s Interesting Intials Fund is making a good challenge but it might be too little too late. With still one more month to go before the winner is announced, has M made a little space on her mantelpiece for the winning trophy? Yes, there will be an actual physical trophy! All August dividends have been added to the respective portfolios. However, please let me know if I’ve missed any (or if there are any errors) as there are so many to keep track of. Of the real portfolios, behind the Underdogs Fund is my own Funky Monkey Fund. Mr Z’s Undead Monkey Fund makes it back into the top five, with FireVLondon’s B Team Fund languishing in mid-table obscurity and Cerridwen’s Eye of Toad Fund still in the bottom 3. John Kingham’s Pigmamig Fund drops out of the top 5, with Huw’s Kunniga Apa Fund dropping to 9th place. It looks like the ‘expertly picked’ funds will not be claiming the top spots! As mentioned before, diy’s Mutley’s Magic Formula fund maintains its steady process and position in the Top 5. This fund is based on Vanguard’s 60% LifeStrategy Fund and appears to not bounce around as much as the funds made up of just 5 stocks. The best 5 performing shares since the start of the league are Centamin, NMC Health, ARM Holdings, Evraz, and Glencore plc. 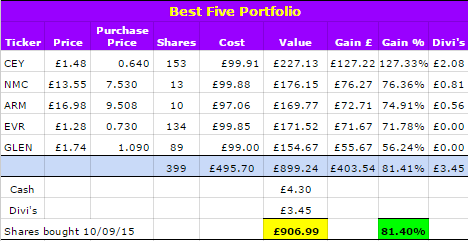 If someone had happened to pick all these shares for their portfolio, they would have seen an awesome gain of over 81% on their initial investment of £500! ARM Holdings is one of my random picks and will shortly be bought out at £17 per share by Softbank. For the purposes of this exercise, as there’s only one more update to go, I’ll leave this as cash in my portfolio, although in real life, I’ll reinvest the cash. The worst 5 performing shares were Poundland, Barclays Bank, Royal Bank of Scotland, Nostrum Oil & Gas plc and Restaurant Group. 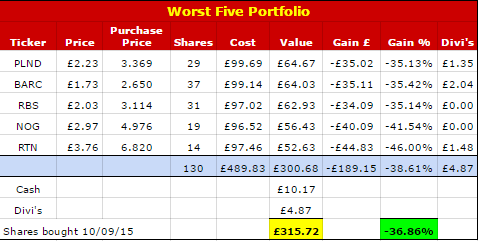 If you’d had the misfortune to pick this lot, you would have seen your portfolio value drop by nearly 37% – not as bad as last month but still ouch! Tune in sometime in October for the exciting finish to this little competition! I am VERY excited about the trophy, and I’m going to put it next to my antique clock… Provided I still win the trophy and there isn’t a financial crash to ruin it! Last at -17%, this is why I stick to index investing. Well, randomly picking stocks isn’t the greatest strategy compared to index investing but not entirely disastrous, unless you invested for real and needed the money immediately! Wonder how your ‘fund’ would look in another year’s time! ?